Stern tubes: The propeller shaft (or tailshaft) is supported in a stern tube bearing of one of a number of designs. The bearing, being at the end of the shaft, is affected by the overhanging weight of the propeller. The propeller mass pulls the outer end of the shaft down, so that there is a tendency for edge loading of the stern tube bearing to occur. The forward part of the propeller shaft is tilted upwards. Weardown of the bearing aggravates this misalignment and whirl due to weardown may give additional problems. 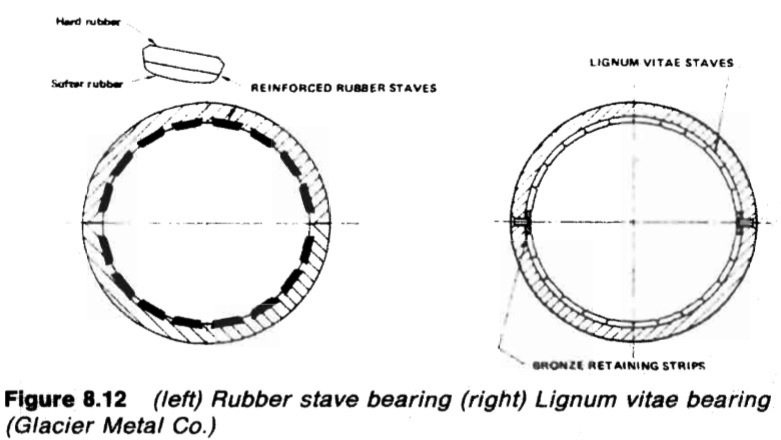 The traditional stern bearing (Figure 8.12) is water-lubricated and consists of a number of lignum vitae staves held by bronze retaining strips, in a gunmetal bush. Lignum vitae is a hardwood with good wear characteristics and is compatible with water. The staves in the lower part of the bearing, are cut and fitted so that the end grain is vertical to give the longest possible life. Staves in the upper part are cut with grain in the axial direction for economy. The staves are shaped with V or U grooves between them at the surface, to allow access for water. The grooves also accommodate any debris. As an alternative to wood, reinforced rubber or Tufhol can be used. Bearing length is equal to four times shaft diameter. Stern tubes (Figure 8.13) are supported at the after end by the stern frame boss and at the forward end in the aft peak bulkhead. Their cast iron construction requires strong support in way of the bearing, from the stem frame boss. A steel nut at the outboard end retains the tube in position, with its collar hard against the sternframe and the bearing section firm within the stem frame boss. Welded studs hold the forward flange against the aft peak bulkhead. Sea water, which enters at the after end or from the circulation system to cool and lubricate, is an electrolyte which will support galvanic corrosion. Wastage of the vulnerable steel shaft is prevented by a shrunk-on bronze liner and rubber seal sandwiched between the propeller hub and the liner end. It is essential that the rubber has freedom to flow when nipped between the hub and liner. Excessive weardown of bearing materials due to vibration or whirl, poor quality of work when rewooding, inferior materials, presence of sand/sediment in the water or propeller damage, could necessitate early rewooding. The life of the bearing for vessels with engines aft, and particularly tankers and ore carriers which spend long periods in ballast, has been short with rewooding being needed in perhaps eighteen months. 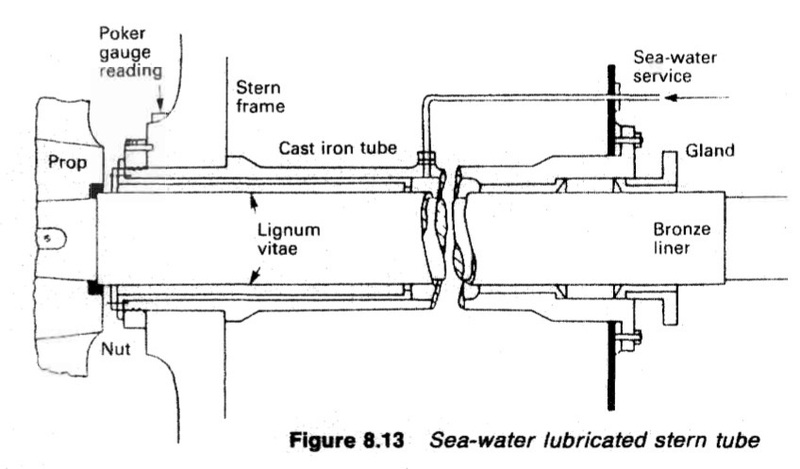 The centre of the stern-tube is connected to a sea-water service line which, together with ingress of water between the shaft and bush, provides the cooling and lubrication. A packed gland seals the forward end of the bearing and is adjusted to permit a slight trickle of water along the shaft and into the tunnel well where it is regularly removed with the bilge pump. Bearing clearances are liberal both to accommodate the swelling which occurs when the staves are immersed in water and to permit the essential flow of water through the bearing. A large number of vessels with water-lubricated bearings are still in service and they continue to be installed. Inspection of sea-water lubricated stern tubes and tailshaft During drydock inspection, bearing weardown is measured by poker gauge or by inserting a wedge between the shaft and bearing from the outside. The permissible wear is in the region of 9—12 mm on large diameter shafts. The examination of the type of tailshaft described above requires removal of the propeller and inward withdrawal of the propeller shaft. The operation calls for the erection of staging, use of a large, suspended ram or tup for the spanner to slacken the nut and wedges to start the propeller. The nut remains on the thread after being slackened for safety reasons. Accidents have been caused by the sudden loosening of propellers with no nut in place to act as a stop. Timber between the aft peak bulkhead and the flange at the forward end of the tailshaft, supports the shaft against the action of the wedges. The examination when a tailshaft has operated in a sea-water lubricated bearing and where the propeller Is keyed, may reveal (Figure 8.14) a number of defects. There is a potential for cracks in the keyway area but the likelihood of these occurring has been reduced by the employment of sled type keys, radiused corners within the keyway and spooning at the forward end. A plain keyway milled in a shaft taper, is a weakening factor which allows deformation of the surface when push up is applied to the propeller and where there is any transmission of torque from the shaft via the key to the propeller hub. Torque causes a deformation which tends to open the keyway. The rubber seal sandwiched by the propeller hub and protective bronze liner, prevents ingress of sea water which would act as an electrolyte to promote galvanic corrosion of the exposed part of the shaft. The shrunk-on bronze liner, fitted to protect the steel shaft against black corrosion may itself be damaged by working conditions. Shaft whirl can lead to patches marked by cavitation erosion, scoring occurs due to the stern gland packing and liner cracking has sometimes penetrated through to cause corrosion cracking in the shaft.